Start e-Prescribing in Missouri Today! As of July 2015, Missouri prescribers are allowed to send both controlled and non-controlled substance prescriptions electronically. MDToolbox is an approved vendor in Missouri and our e-Prescribing software, MDToolbox-Rx, meets all of the requirements for e-Prescribing and EPCS. 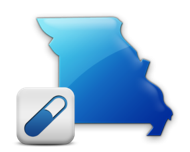 Missouri allows e-Prescribing of both controlled and non-controlled substances. As of July 30, 2015, Missouri changed its controlled substance regulations to match the federal DEA regulations for Electronic Prescriptions for Controlled Substances (EPCS). Prescribers of controlled substances in Missouri must obtain registrations from both the Missouri Bureau of Narcotics and Dangerous Drugs (BNDD) and the federal DEA. Missouri is the only state without a Prescription Monitoring Program in place.